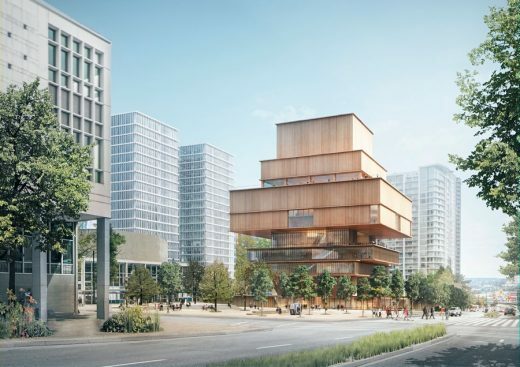 The Vancouver Art Gallery today unveiled Herzog & de Meuron’s conceptual design for a new museum building in downtown Vancouver. The 310,000-square-foot building is designed to serve the Gallery’s expanding collection and to support the work of artists from Vancouver, throughout British Columbia and across the world, to engage its growing audiences and enrich educational opportunities for lifelong learning, and to advance Vancouver’s reputation as an international centre for contemporary art. The new building features over 85,000 square feet of exhibition space—more than doubling its current size—with 40,000 square feet of galleries dedicated to the museum’s vast collection. It also features a new education centre that includes a 350-seat auditorium, workshops and a resource centre for research, library services and artist archives. A public presentation of the conceptual design by the Gallery’s leadership and the architects, featuring the Honourable Judith Guichon, Lieutenant Governor of British Columbia, the Honourable Peter Fassbender, Minister of Community, Sport and Cultural Development, and His Worship Gregor Robertson, Mayor of Vancouver, will be held on Tuesday, September 29, at 6:30 pm at the Queen Elizabeth Theatre. Starting September 30, a presentation on the new museum will be on view free of charge at the Gallery, and details of the design will be available online at www.vanartgallery.bc.ca/future. The unveiling of the conceptual design marks the end of the first stage of the building design process, and is intended to describe the context for the Gallery building within the city, and the character and capacity of the new Gallery’s interior and exterior spaces. 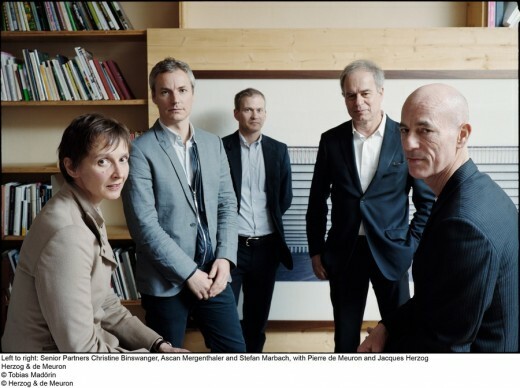 The Swiss-based international firm of Herzog & de Meuron is renowned for its sensitivity to and history of working with contemporary artists, and for designs that are both highly inventive and responsive to the site, geography and culture of the place for which they are conceived. Their design for the Gallery’s 230-foot-high building comprises seven publicly accessible floors, plus two below-grade levels for storage and parking. There is also additional space for future expansion. It combines low and high elements to create an intimate human scale that activates the street level, while embracing a bold verticality and solid sculptural form that strongly affirm the presence of the Gallery within the cityscape. The lower levels are mostly transparent, making many of the Gallery’s activities visible, while the upper levels, which primarily house exhibition spaces, are more solid and opaque. The architects’ intent is to use wood for the building. The material is sustainable and evokes the architectural history of the region, including the two-storey wooden row houses that surrounded Larwill Park in the early twentieth century. British Columbia is at the forefront of constructing large wood buildings, making it an ideal place for a building of this material. The Gallery will raise an estimated $350 million Canadian dollars from public and private sources, including a $50 million endowment to support the expanded cost of operation. In addition to private fundraising, it has received a $50 million gift from the Province of British Columbia and the generous donation of the Larwill Park site by the City of Vancouver. The unveiling of the conceptual design of the Gallery marks the launch of the public phase of the Capital Campaign. Herzog & de Meuron, recipient of the prestigious Pritzker Architecture Prize, have designed the Vancouver Art Gallery’s new museum as a symmetrical, upright building combining opaque and transparent surfaces, with larger volumes concentrated at the top and minimal mass at the bottom. By lifting the bulk of the structure high above the street, the design allows light and air to filter down to an active, open-air courtyard below. The building includes a one-storey structure on the ground level that frames the courtyard and houses free exhibition space as well as a café, store, and a resource centre for research, library services and artist archives. The expansive 40,000-square-foot, open-air courtyard, which will be crisscrossed daily by museum-goers and neighbourhood pedestrians, will host art installations, performances, concerts, film screenings, and collaborative programs with other cultural organizations. In this way, the design will transform an underused site at West Georgia and Cambie Streets—the only block of vacant public land left in downtown Vancouver—into a vibrant new cultural destination. The building offers a variety of galleries of different heights and proportions, natural light conditions and views. Outside, generous setbacks and overhangs create covered as well as open terrace spaces on different levels, allowing visitors to enjoy views of the city and the North Shore Mountains. The Gallery also plans to dedicate exhibition space on the ground floor to its Institute of Asian Art, which was launched in autumn 2014, to further develop exhibitions, public programs, the collection, and scholarship devoted to the visual arts of Asia, with a particular emphasis on contemporary art from China, India, Japan and Korea. Along with dedicated education spaces including an auditorium for lectures, performances and events, the expanded museum also houses many new features including greatly expanded storage and art preparation areas; a conservation lab that will be a resource for the Province; and an expanded store, a café and restaurant. “The project for the new Vancouver Art Gallery has a civic dimension that can contribute to the life and identity of the city, in which many artists of international reputation live and work. 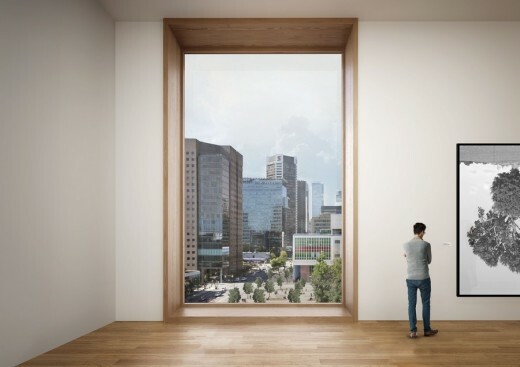 It will be a powerful statement to construct this large building out of wood, a material with a long tradition in British Columbia,” said Christine Binswanger, Partner in Charge for the Gallery project, at Herzog & de Meuron. Visitors will enter the Gallery via the courtyard, which is framed by a continuous low-rise street front building and is accessible from all four sides. The cantilevered roofs of the low-rise structure and the main building offer ample covered outdoor space, while at the same time allowing sun to filter in during the spring and summer. The Gallery’s free gallery, resource centre, café and store can be accessed from the courtyard and the street, while a sweeping ceremonial staircase between Cambie Street and the courtyard leads to the lobby below. A sunken garden brings nature and light into the lobby and surrounding exhibition spaces. Double-height galleries rise up to street level to provide daylight and allow passersby to see inside. 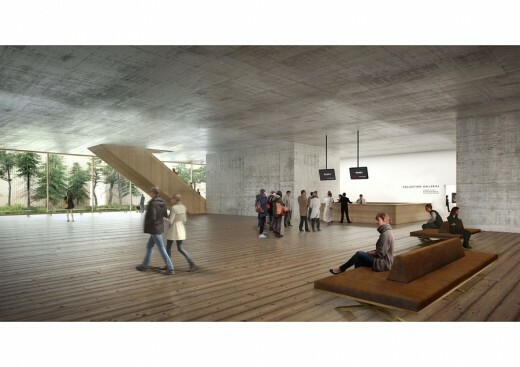 As visitors ascend from the lobby, they will be able to access the auditorium, the restaurant with its large covered terrace that overlooks the city, and the main concourses leading up to exhibition galleries. The museum building is capped by an expansive rooftop gallery and terrace. The environmental sustainability of the building is a high priority for the Gallery, which seeks LEED Gold certification and plans to employ other sustainability features that will be developed during the later design phases. Through a thorough master planning process initiated in 2004, the need for a new Vancouver Art Gallery building of approximately 320,000 square feet was determined, and subsequently a two-acre city-owned site at West Georgia and Cambie Streets, known as Larwill Park, was identified as the optimal location. After an extensive international search process, the Vancouver Art Gallery selected Herzog & de Meuron as its architect in April 2014. The firm has created critically and publicly acclaimed designs for art museums and public spaces around the world, including Tate Modern in London, Pérez Art Museum in Miami, and the de Young Museum in San Francisco. This project will be Herzog & de Meuron’s first building in Canada. The Gallery has hired Vancouver-based Perkins + Will to serve as Executive Architect for the project, working closely with Herzog & de Meuron in the realization of the design. The new museum and courtyard will be built on two thirds of the Larwill Park site, just a few blocks east of the Gallery’s current home. The City is reserving the rest of the site for future development. The area is a nexus that bridges several important neighbourhoods, including the downtown area, Chinatown, Gastown and East Vancouver. Once one of Vancouver’s most popular public gathering places, Larwill Park served as a venue for sporting events, travelling shows, political demonstrations and, more recently, spectators at the 2010 Vancouver Winter Olympics and the 2015 FIFA Women’s World Cup. A dynamic part of Vancouver, the neighbourhood is set to change dramatically in the next ten years and the Gallery is poised to expand the heart of the city by connecting central downtown with East Vancouver. Minneapolis, USA (2005); and de Young Museum in San Francisco, USA (2005). The firm‘s latest completed museums are the Parrish Art Museum in Water Mill, NY, USA (2012) and the Pérez Art Museum Miami, which opened to the public during Art Basel Miami Beach in December 2013. Vancouver, BC — April 29, 2014 — The Vancouver Art Gallery has selected Herzog & de Meuron to design its new and expanded home in downtown Vancouver. The new museum building will be the first project in Canada for the Pritzker Prize–winning firm. At approximately 300,000 square feet, the new Gallery will provide more than double the space of the current facility to support the museum’s collections, exhibitions, and programs, which have increased exponentially over the past decade. It will also enable the Gallery to better serve its growing audience, expand the international reach and range of its program, and further enhance Vancouver’s standing as a major centre of cultural production. The Gallery plans to unveil conceptual designs for the new building in early 2015. 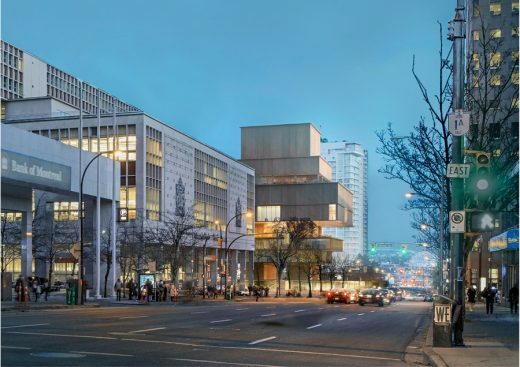 The Vancouver Art Gallery’s Architect Selection Committee was unanimous in their recommendation of Herzog & de Meuron to the Gallery’s Board of Trustees. Their recommendation was based on the firm’s proven ability to create innovative museum buildings that place prominence on artists and institutional mission, and the firm’s vision for the new Gallery, which recognizes and responds to the context and needs of the museum now and in the future. Based in Basel, Switzerland, Herzog & de Meuron have had a longstanding engagement with the visual arts, working with institutions and artists around the world on such renowned buildings as the Tate Modern in London, the Schaulager in Basel, the Pérez Art Museum Miami, and the Walker Art Center in Minneapolis. In addition, the firm has realized some of its most significant work around the Pacific, including the de Young Museum in San Francisco, California; Prada Aoyama in Tokyo, Japan; and the National Stadium (“Bird’s Nest”) in Beijing, China. “Herzog & de Meuron’s designs are recognized internationally for both their creativity and sensitivity to place. Their buildings not only effectively and elegantly meet the needs of their users, but also become places that are part of the cultural draw and identity of a city. We look forward to collaborating with Herzog & de Meuron to create an architecturally significant new museum that will be an important beacon for our city and enhance the cultural community of Vancouver and of the Province of British Columbia,” said Bruce Munro Wright, Chair of the Gallery’s Board of Trustees and Chair of the Architect Selection Committee. Herzog & de Meuron were selected from a group of five shortlisted firms from across the globe—including Diller Scofidio + Renfro (New York), KPMB Architects (Toronto), SANAA (Tokyo), and Tod Williams Billie Tsien Architects (New York)—following a series of in-depth interviews and site visits to significant projects designed by each firm. The finalists, announced in January 2014, represented five of 75 firms from 16 different countries, who submitted their credentials through an open request for qualifications (RFQ) process issued by the Gallery. 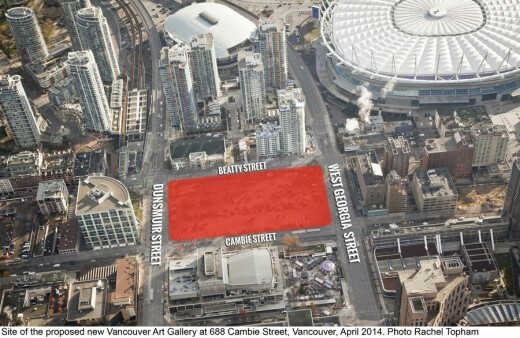 The new Vancouver Art Gallery will be located at West Georgia and Cambie Streets in downtown Vancouver, on a city-owned site that was awarded to the museum by unanimous vote of the Vancouver City Council in April 2013. 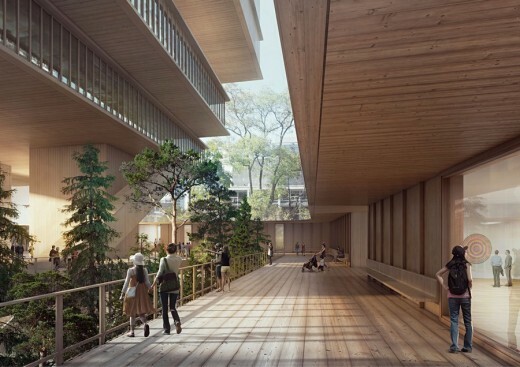 The new building will include dedicated space for the museum’s growing collections, expanded indoor and outdoor exhibition spaces for the Gallery’s dynamic exhibitions, and new educational facilities that will allow it to dramatically increase educational and public programs. The new Gallery building will enhance the cultural, social, and community space in the heart of downtown Vancouver and become an important economic driver for the city—creating a public centre that connects the downtown area, Chinatown, Gastown, and East Vancouver, and that attracts visitors and cultural tourists from throughout the region and internationally. The Vancouver Art Gallery has already received significant support for its expansion, including a $50-million gift from the Province of British Columbia and the designation by the City of Vancouver of the downtown site at West Georgia and Cambie Streets. The Gallery expects to announce early capital gifts in the coming weeks and launch the public phase of the capital campaign as the conceptual design is unveiled.